Explobers is a unique puzzle platformer that requires you to use multiple player characters to solve difficult challenges by using their powers (and lives) to destroy terrain and build blocks in order to navigate through over eighty tricky stages. 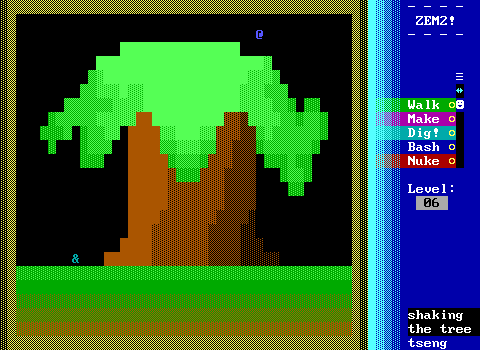 The game begins in the familiar CGA palette of classic PCs. As you progress, new graphic modes become available and you may find some secrets! Explobers will be featured as a part of the upcoming 2018 Smithsonian American Art Museum Arcade in Washington DC on July 22, 2018. Explobers has a trailer. It also has an official website. I worked on this game through most of 2017. It is released as donationware. If you enjoy it, please consider the suggested donation of $4.00 USD by purchasing it on itch.io or GameJolt. The game is fully playable in Japanese. Your shadows have split from you and you must guide them to the exit. You can move at will, but the shadows need to be given commands. Pick up command boxes and drop them where you want the shadows to act. Ten stages of challenging puzzle platforming by proxy. Press ‘L’ on the title screen to load the game from your previous play session. The game autosaves and starting a new game will overwrite previous progress. Made for Klik of the Month Klub #93. There are many balls! Get one of them to reach the exit! Have other balls turn to stone and become platforms to guide other balls to advance through all eight stages. Build your way to success! Extra points awarded for balls left over at the end of stages. Click on your holiday penguins to make them (left-click) jump or (right-click) turn around. Get your penguins to collect all the green thingies to advance! Press SPACE at any point to retry the level. Made for Klik of the Month Klub #54. For the final game in the Zem! 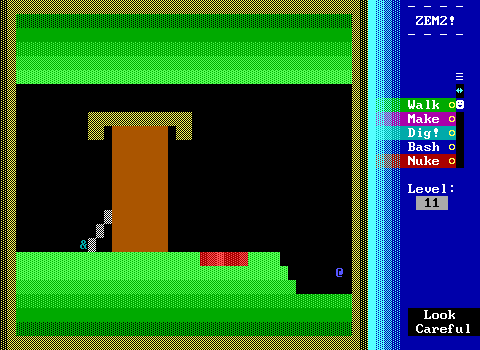 series, the game moves away from its Lemmings root and toward an action platformer. The player character is Ben (or Jenna) Hunter, a lemming hunter, who has to chase down and save Zem before Zem walks into a pit of spikes or any other danger. This was announced as my official retirement from ZZT game development. I had begun working on the game almost immediately after Zem! 2 (the Zem! 2 Level Pack included a preview of Zem! X). ZZT games require ZZT to run. Download it from Z2. Zem! 2 was well-received, but it was frequently noted that its level design was excessively simple and presented no real challenge. Speaking to fellow ZZTers in the chat rooms of the day, the plan was hatched to collect levels from the community rather than have a traditional sequel. The game features twenty-five stages from ten contributors in addition to myself. Contributors include Gunner, Scribbit, Viovis, Glynth, tseng, and more. Levels tended toward greater challenge and some contributors programmed some interesting new elements. Released about half a year after the original Zem! 2. While Zem! asked players to manipulate a cursor that plotted blocks to help shepherd a lemming to an exit, Zem! 2 puts you in control of the same lemming, Zem. Zem still marches on, but now the player can intervene to grant him abilities based on those in the original Lemmings game by Psygnosis. This sequel was released just a month and a half after the first Zem! Zem! and its first sequel were profiled by Dr. Dos in the “Closer Look” series in August 2016. Inspired by Lemmings, this ZZT engine game–the beginning of a four-entry series–puts the player in control of a cursor that builds block in order to safely guide the eternally marching Zem to the exit portal. ZZT games require ZZT to run. Zem! and its first sequel were profiled by Dr. Dos in his “Closer Look” series in August 2016.